Easy One Pot Beef Stew. One pot meals are a this cook’s dream. I really don’t care for cleaning a lot of bowls and pots. One pot is enough to clean. With no cleaning to do, I have more time for eating and cooking! On this rainy, cloudy day, comfort food is number one on my list. 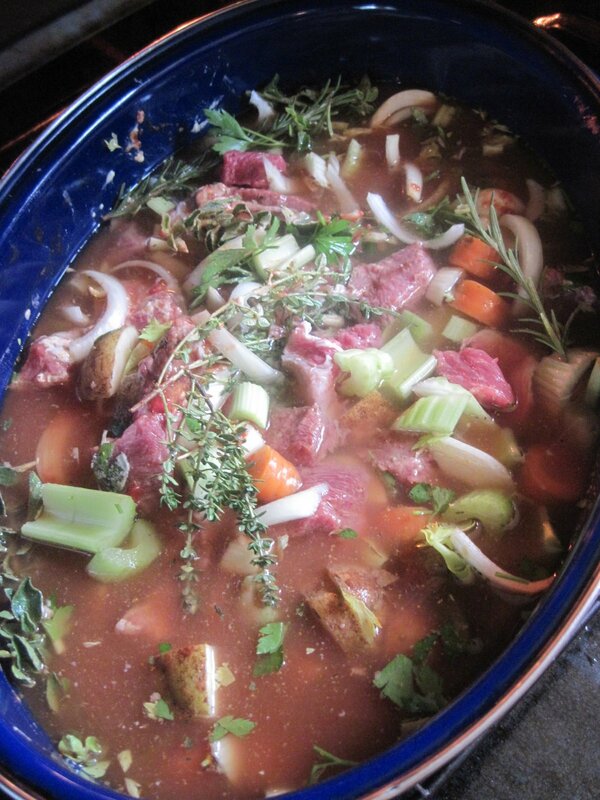 Easy one pot beef stew is a perfect comfort meal. This is an easy meal that you can cook in the oven or slow cooker. It will be one of your favorites too. 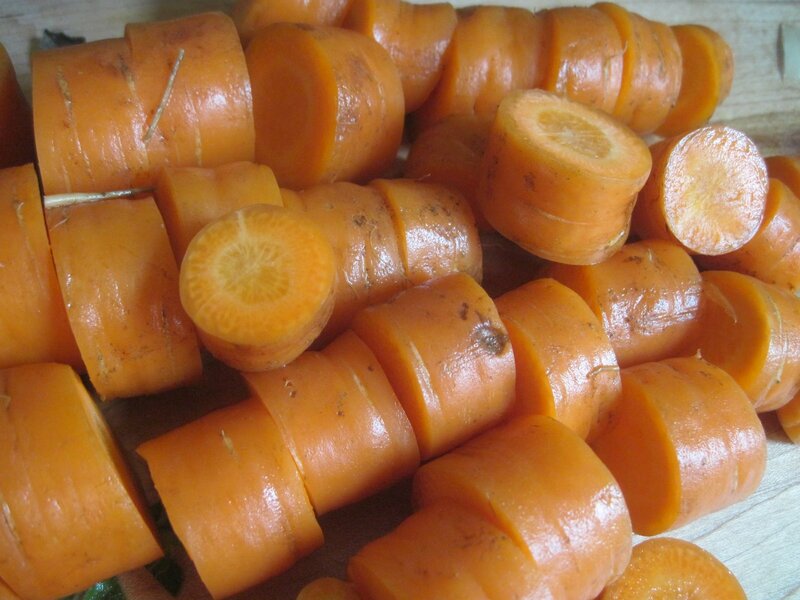 Serve with a chunk of French Bread or serve over egg noodles. Delicious! 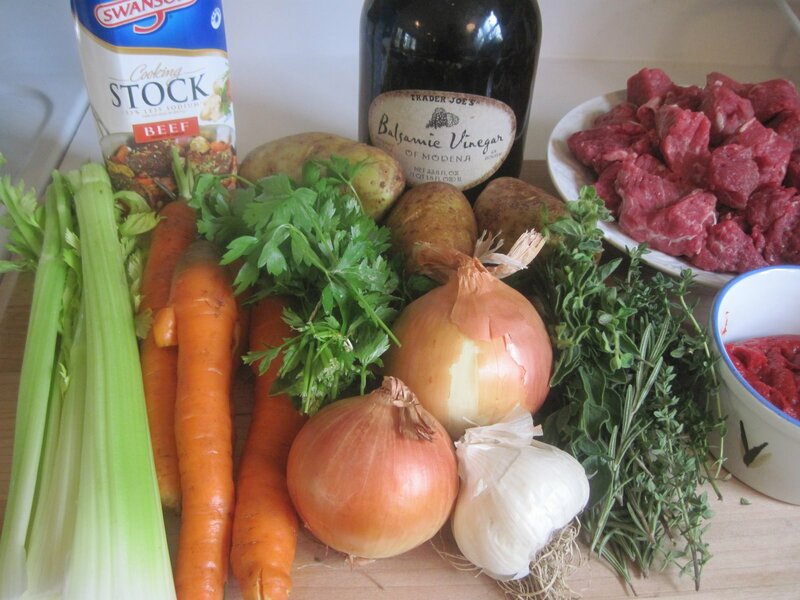 Here’s what you will be needing for yummy beef stew: Beef Chuck, Tomato Paste, Balsamic Vinegar, Flour, Salt and Pepper, Onions, Garlic, Potatoes, Carrots, Celery, Beef Stock, Water, Oregano, Rosemary, Thyme and flat leaf parsley. 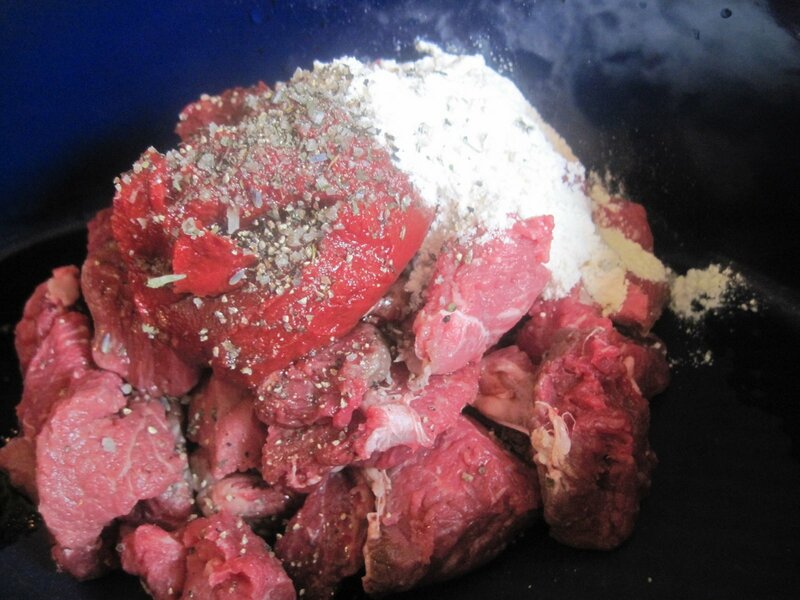 Place beef, tomato paste, flour, salt and pepper in pot. 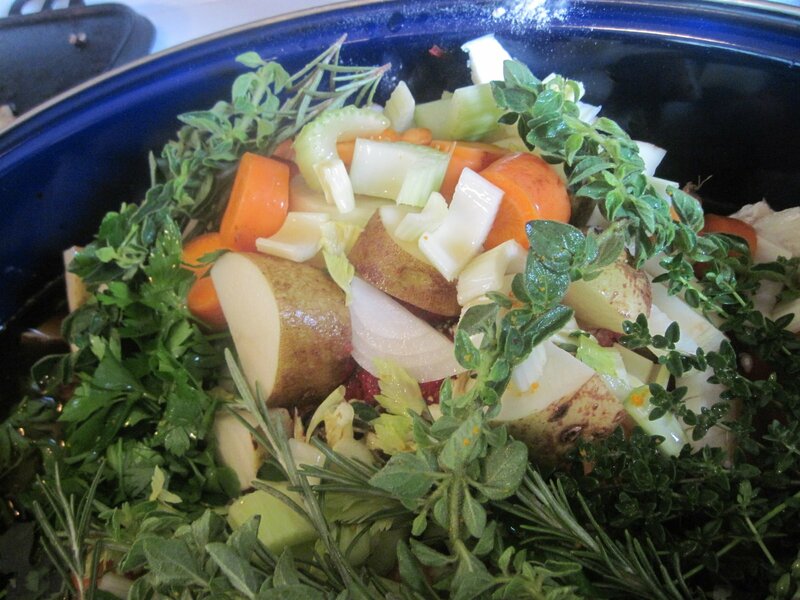 Place vegetables and herbs into pot. 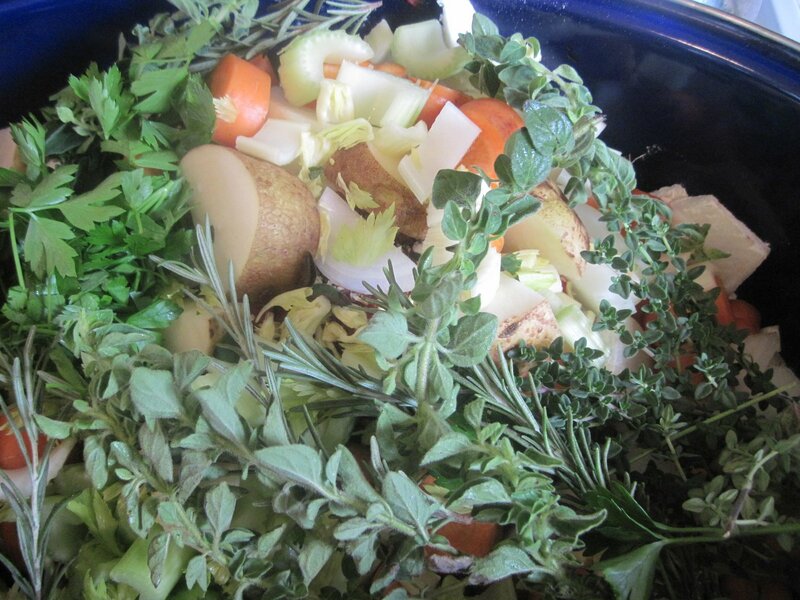 Fresh herbs and fresh veggies, make the perfect stew. 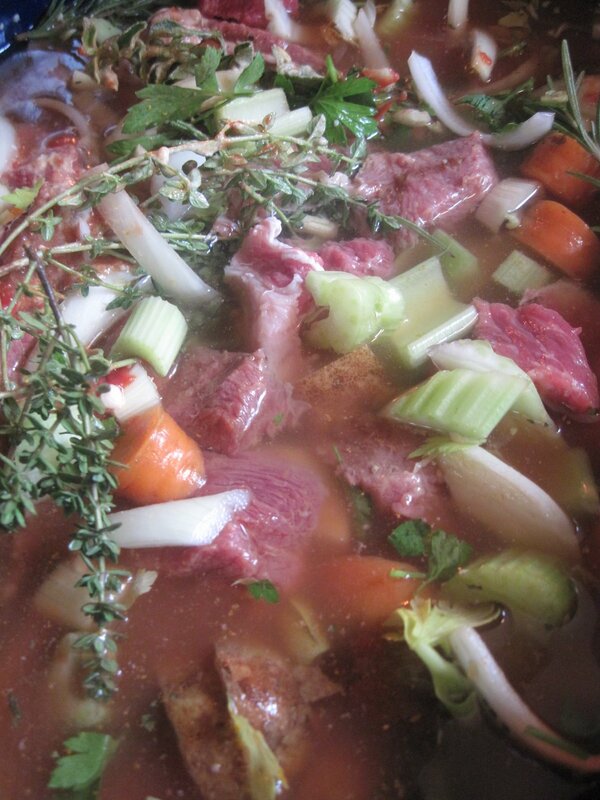 Pour in beef stock and water. Stir up all ingredients for stew. Make sure you have enough liquid to cover beef and vegetables. Cook until meat is fork tender. About 2 1/2 -3 hours. In an 11 quart roaster/ broiler pot, with a tight fitting lid, combine beef, tomato paste, vinegar, flour and salt and pepper. 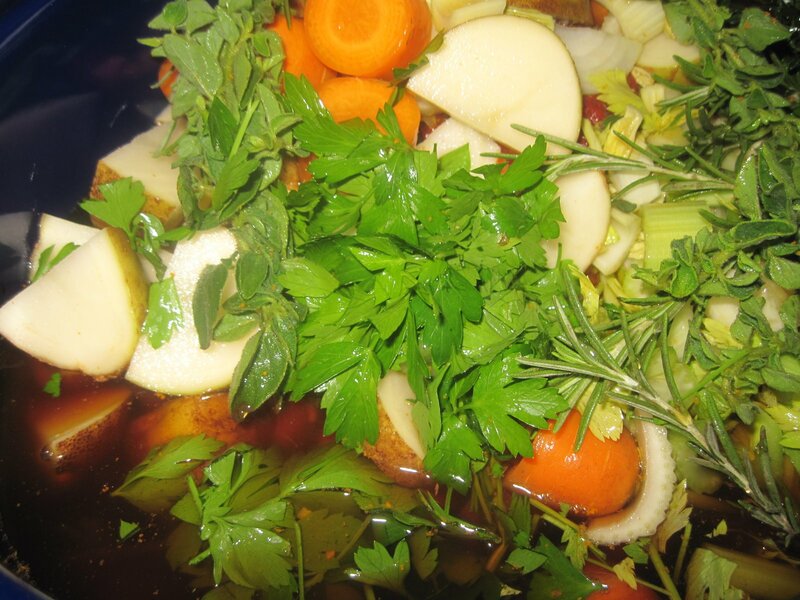 Add chopped vegetables and herbs, water and beef stock. Stir stew every 1/2 hour or so. 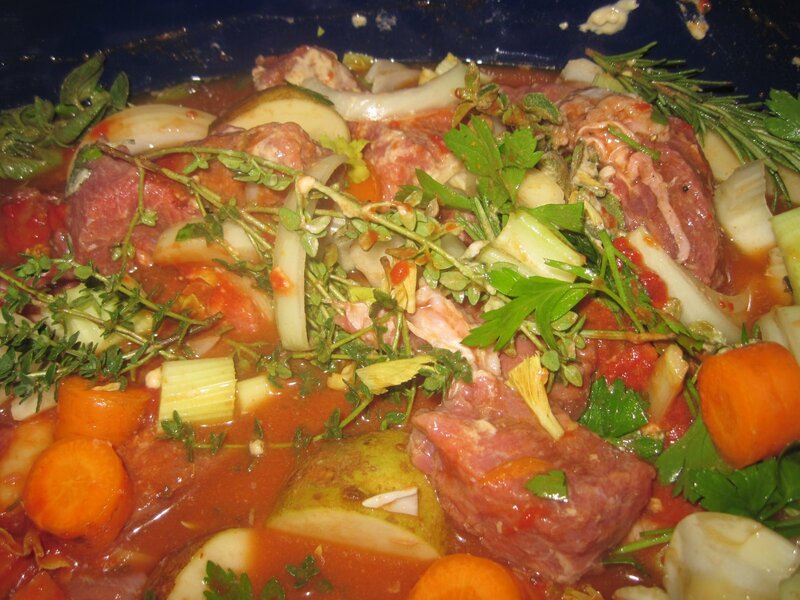 Cook for 2 1/2 – 3 hours or until meat is fork tender. 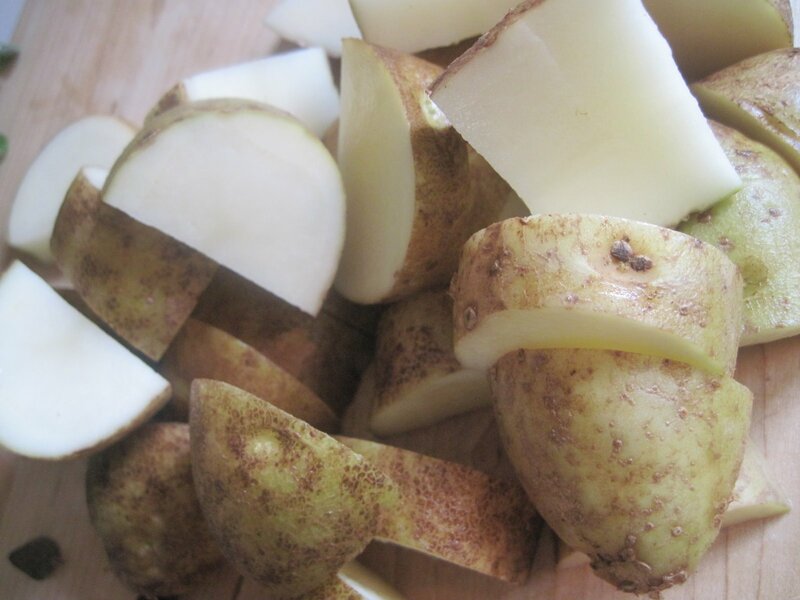 If desired, season with salt and pepper. 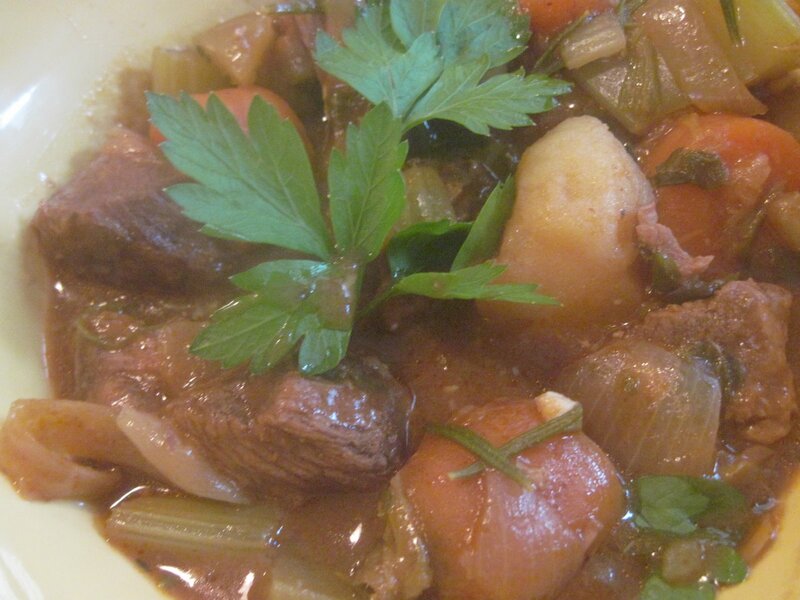 Serve beef stew with crusty French Bread. I have linked up to these fabulous blogs! Your beef stew looks so delicious; I'm a sucker for stews and soups. They're so comforting and home-y, especially on cold, windy days like today. Hi there. 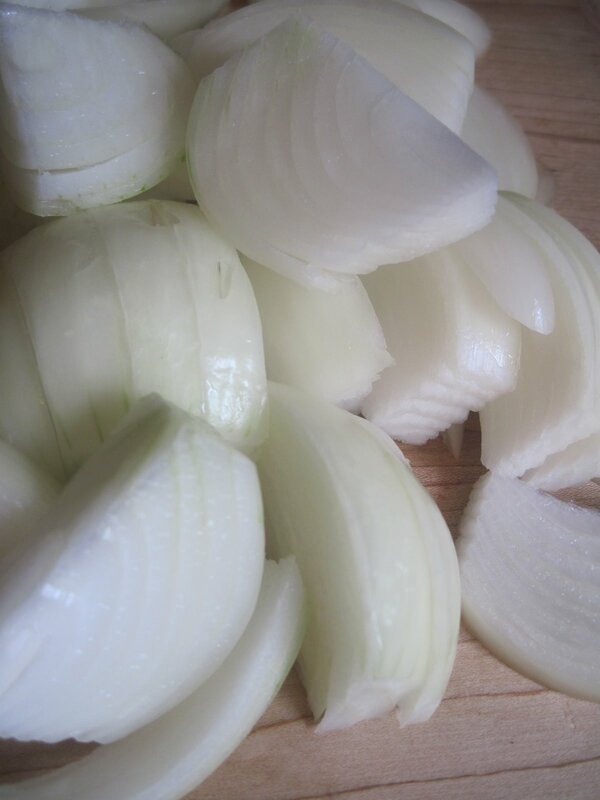 This is a great slow cooker dish! 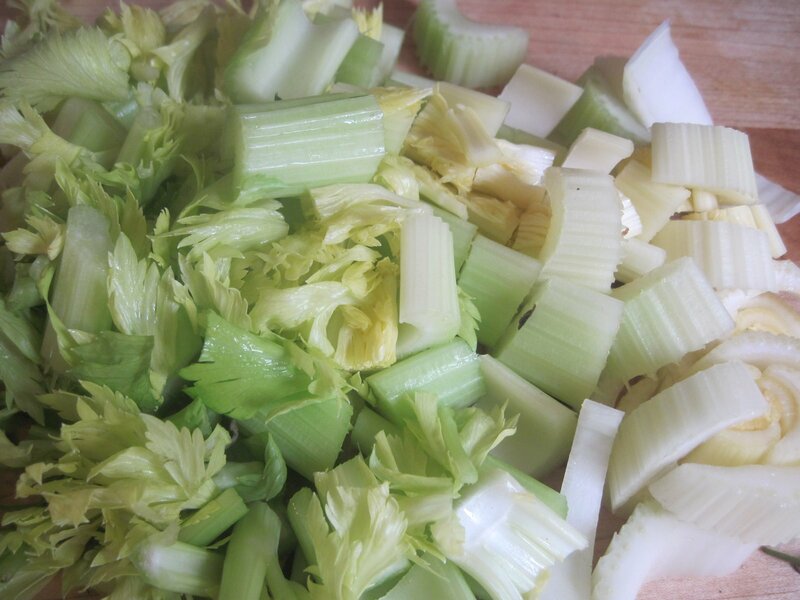 This week's Food on Friday on Carole's Chatter is all about collecting up slow cooker/crockpot recipes. It would be great if you linked this in. This is the link . Have a good week.Ps I haven't seen your follow back yet. Do you follow via GFC or some other way?